This is the end of the 31 day challenge! Woot! I have to say that I’m so glad that I have survived writing a post everyday for 31 days on topics that were very revealing of what happens behind the front door of our house. It hasn’t been easy to say the least between the chaos I’m trying to fix, my health, and of course I had to take care of the PTA fall fundraising event as the chairperson this month as well. It’s been busy to say the least. However, I’ve learned a lot and I think the children have as well. 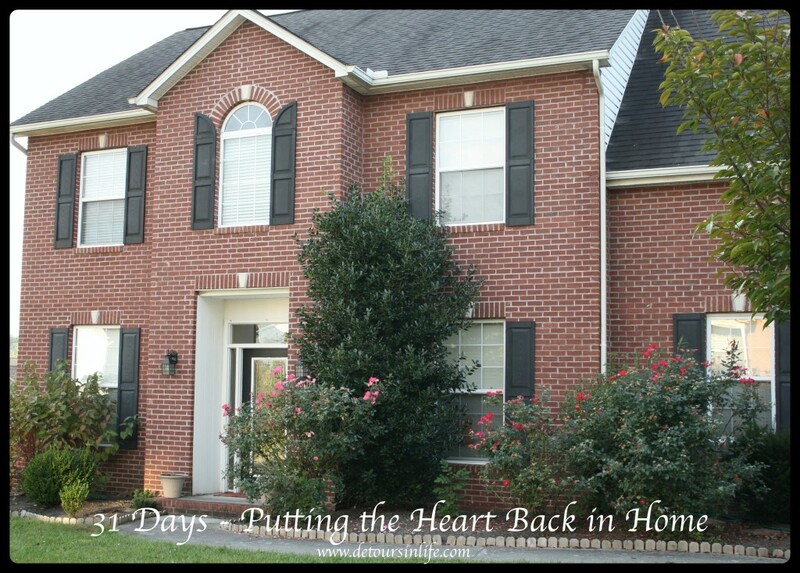 Today I will provide a status update of where things are in restoring the heart in to our home. Mornings run a lot smoother since we implemented the “Get ready for school list”. They come down and know what has to be done before they walk out the door for school. That list will be expanded upon soon as I give my daughter more responsibility for making sure papers are going back in her backpack and she is meeting her responsibilities at school. My son loves checking off his tasks each morning and that keeps him on track. We are still working on the chore chart and having everyone sleeping in their own beds. My daughter has done well so far for over a week but she is still traveling during the night to crawl into b ed with my husband. My son has gotten a little bent out of shape when he gets up in the middle of the night and wants to come crawl in the bed and he finds my daughter already beat him to it. Not all the chaos is caused by the kids. Some of it is caused by me and my husband. So, we are trying to spend less time on electronics, providing individual attention to each child, and being more engaging with them. Still need to do some deep searching on whether the foundation is strong enough to hold up this family or not, but that will take a lot of time to accomplish. I hope if you have read the entire series, you have found things out of my experiences that you can use to help you eliminate the chaos from your home. Leave a comment below on what you felt was your favorite post of the series. Congratulations on #31Days Alecia! Writing straight for the series is a real accomplishment. And just look what you accomplished in your home. 🙂 I’m pretty sure, you all are on your way to some pretty wonderful new habits.